I MET the most interesting person in Singapore recently. She was helpful, efficient, well-presented … and she wasn’t human. Sophie was a ‘droid. Forget Star Wars sci-fi, the new 223-guestroom Sofitel Singapore City Centre is at the forefront of new hotel technology with the service-minded Sophie ready to answer questions and deliver room service with a smile. Yes Sophie does smile. In fact she smiles all the time, something that even the most eager human concierge can’t always manage. Sophie was the star of the hotel when it opened late like year and sits in the lobby in her blue and flower–print uniform waiting to be of service. She proved so popular that she was soon joined by Xavier, a ‘droid butler, in February this year (just in time for Valentine’s Day - just saying…) The robots can both take lifts using a special Wi-Fi sensor and navigate their way to your room. So what is it like to be served by Sophie? Enjoyable but disconcerting actually because you have the overwhelming urge to interact. Nevertheless the whole experience of being waited on by Xavier and Sophie is fun. Their primary function is to extend minibar services to guestrooms and we suspect that mini bar consumption has gone up substantially since they have started delivering to rooms. Guest use words like “adorable’ and ‘cute’ when commenting on them, so they definitely enhance the guest’s experience. Aside from Sophie and Xavier the hotel also utilises two units of housekeeping i-robots to assist Ambassadors provide back of the house services to guests. 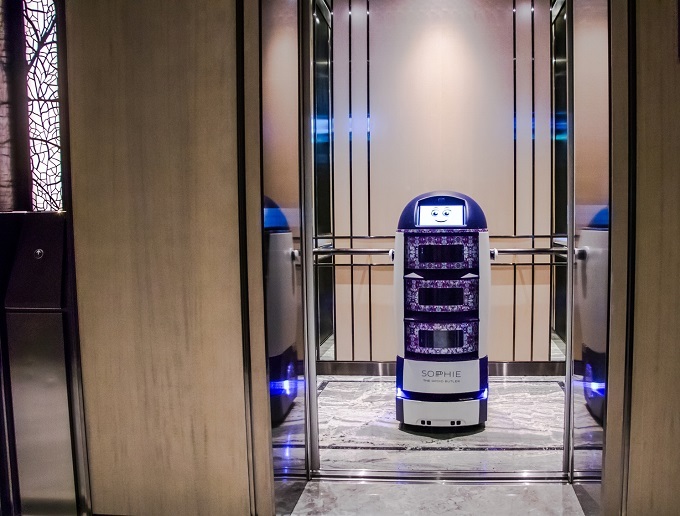 Singapore is a cutting edge destination when it comes to robot hospitality. Here’s a few other Singapore hotels hotels utilising ‘droids. Be an explorer. The universe is filled with wonder and magical things.